Happy Saints: Have you prayed the Stations of the Cross this Lent? Have you prayed the Stations of the Cross this Lent? "I love this anything that gets my kids more interested in the Passion! We used our Way of the Cross books last night at the Stations, and my 4 and 6 year olds followed along even to the point of tears - I am glad to have age appropriate artwork for them instead of something too intense for their little brains to wrap around." Have you prayed the Stations of the Cross with your family or students this Lent? If not, this week is your last chance for the year, especially Good Friday. The ‘Happy Saints Way of the Cross’ eBook is a great resource that is child-friendly and easy to follow. You can print out the posters, prayer cards or badges, or present them as onscreen slides. 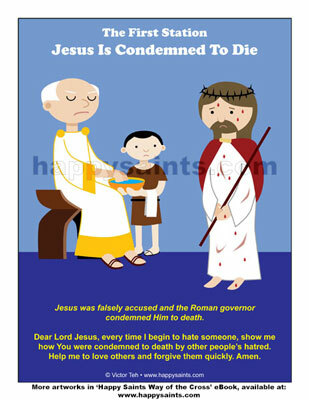 The picture above is a sample artwork from the Happy Saints Way of the Cross PDF ebook, featuring printable artworks of the Stations of the Cross, including posters, prayer cards, coloring pages and badges for activities for Holy Week.